The Japanese government has committed US$ 16 M for reconstruction of three bridges along National Highway 1 in the country. To this effect, the exchange of notes was signed yesterday in New Delhi between Ambassador of Japan to Bhutan, Takeshi Yagi and Bhutan’s Ambassador to Japan, General Vestop Namgyel. The agreement for the same was signed and handed over to the Bhutanese government today in Thimphu. 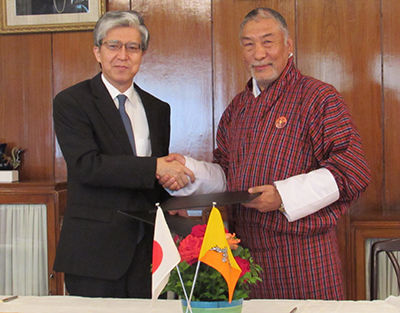 It was signed between the Secretary of GNHC, Sonam Wangchuk and the Chief Representative of JICA Bhutan, Yumiko Asakuma. Under the grant, Chuzomsa and Nikachu Bridge in Wangdue Phodrang and Zalam Chu Bridge between Trongsa and Wangdue Phodrang will be reconstructed. JICA has so far built over 19 bridges across the country, of which 16 are along the highway and three are farm road bridges. Similarly, the Japanese government committed US$ 2 M for technical cooperation project– Support for Community Engagement in Local Governance. The main purpose of this cooperation is to strengthen ownership and engagement of community groups to participate in local governance.